From each patient involved in MaGiCAD, blood is taken from the arterial sheath. For the majority of the patients the sheath is placed in the femoral artery, although in approximately 2% of cases the sheath is placed in the brachial or radial arteries. Approximately 40 ml of blood is withdrawn into a 50 ml syringe, and platelet-poor plasma and serum prepared as follows. The highest quality platelet-poor plasma (ppp) is made with a minimum of platelet degranulation. In order to reduce platelet degranulation to its minimum, Diatube H CTAD tubes (Beckton-Dickinson) are used, which contain 3.2% citrate together with a mixture of platelet degranulation inhibitors. The Diatube H tubes are pre-cooled on ice. Immediately upon receiving the syringe of blood 4.5 ml of whole blood is added to each diatube, and the tube inverted and replaced on ice. The remainder of the blood is used to make serum. Following incubation on ice for between 15 and 60 minutes, the diatubes are spun at 2500g at 4°C in a pre-cooled centrifuge. The blood cells are pelletted, and only 1 ml of the plasma from the centre of the supernatant is taken and frozen in aliquots at -80°C. The remaining blood in the syringe is put into 15 ml polypropylene tubes and left to clot at room temperature. After clotting for between 2 and 3 hours the tube is spun at 4000g for 5 minutes. Usually the clot does not readily spin down on the first attempt. In these cases, the clot is loosened from the wall of the tube and spun down again. 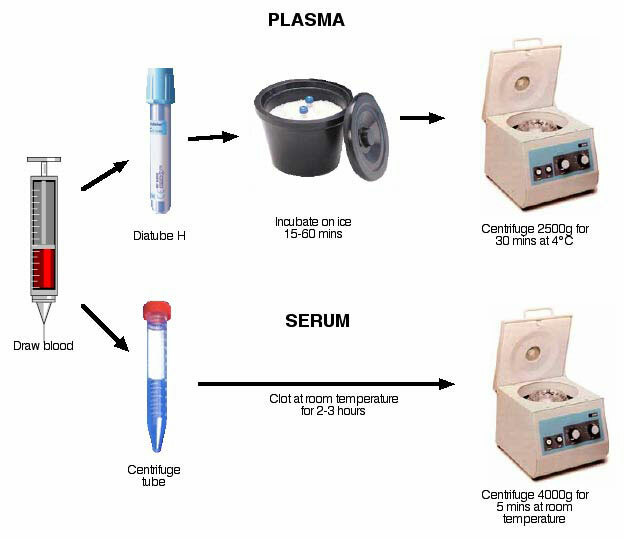 Once the clot is spun down to leave the serum above as a supernatant, the serum is removed and transferred into a fresh 15 ml tube. The serum is spun once more to pellet all remaining red blood cells, and the supernatant transferred into the 1 ml microtitre plates. All samples are stored at -80°C in 96 well plates that have a maximum capacity of 1 ml.